The renowned Safrai Gallery in Jerusalem is sending Temple Adat Shalom 1,500 pieces of art created by 100 Israeli artists, which will be available for you to view (and perhaps purchase!) in our social hall turned Art Gallery. Our Art Gallery will be open February 21-24. Admission to opening night showing includes kosher hors d’oeuvres, beverages and music. Your $10 admission fee can be applied to any art purchase (one admission fee per piece of art). Temple Adat Shalom Amudei or Legacy members can come at 6:30 pm for a special preview, which includes free admission to the gallery! Special preview at 6:30 PM for If you are a TAS Amudei or Legacy member, please click here to RSVP your attendance at the Thursday preview, or call the Temple Office at 858.451.1200. 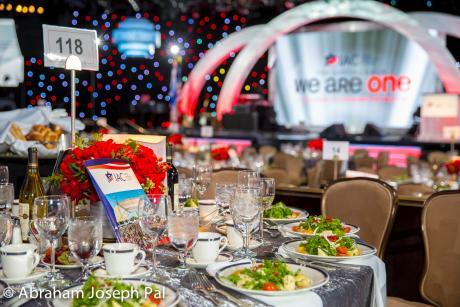 The IAC’s annual fundraising gala is an incredible evening of inspiration and philanthropy with high caliber speakers, the best of Israel’s entertainers, and an in-depth look at how the IAC creates and strengthen our community. This photographic show will feature the work of artists near and far as we examine Jews and Jewish life around the globe. The diaspora, an important part of our Jewish history, was the beginning of our people being scattered to new and foreign lands. Today, as Jews, we inhabit almost every country in the world and these photographs capture what is both common and unique to the Jews residing in each country represented.